Imagine materials strong enough to use in building airplanes or motor cars, yet are literally lighter than air. Soon, that may not be so hard to do because a team of researchers from MIT and Lawrence Livermore National Laboratory (LLNL) have developed new ultra-lightweight materials that are as light as aerogel, but 10,000 times stiffer, and may one day revolutionize aerospace and automotive designs. Aerogels are incredibly light, so light that the record holder, aerographene, boasts a density of just 0.16 mg/cm3. Currently, aerogels are used for insulation, tennis racquets, as a means of controlling oil spills, and were used on the NASA Stardust mission to collect samples from a comet’s tail. Unfortunately, despite its seemingly ephemeral nature, its very much a solid and will shatter if pressed hard enough, so its use is limited. The new materials developed by the MIT/LLNL team aren't aerogels, but are metamaterials. That is, artificial materials with properties that aren't found in nature. 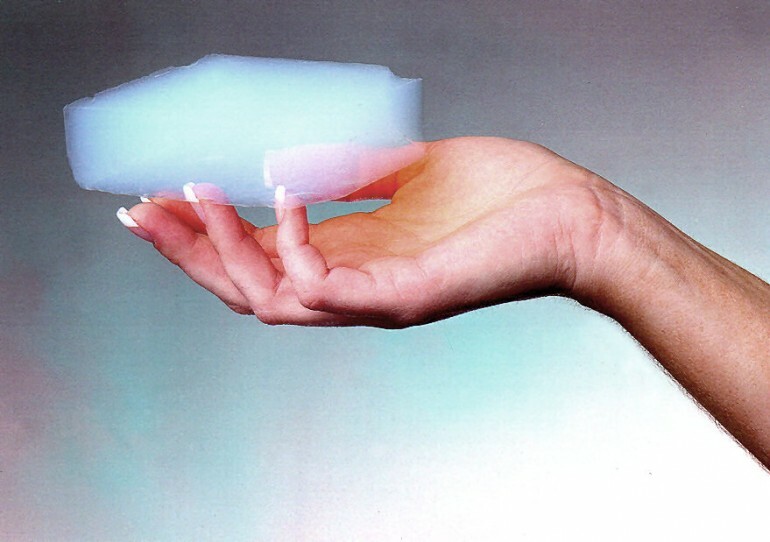 The idea is to structure it, so that it has the lightness of aerogel, but is much stronger. 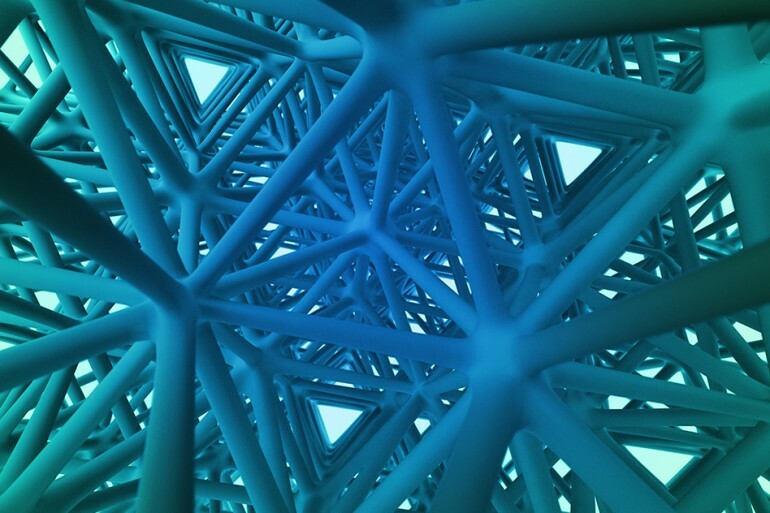 The strength of the new materials comes from their geometric structure, not their chemical composition. The new materials were made using projection micro-stereolithography, a form of desktop 3D printing that works on a microscopic level and can create highly complex, three-dimensional microstructures layer by layer very quickly for easy prototyping. It involves projecting a beam of ultraviolet light into a tank of polymers, responsive hydrogels, shape memory polymers, or bio-materials using the digital stereolithography technique in the form of masks, similar to those used to create microchips, to shape the layers. 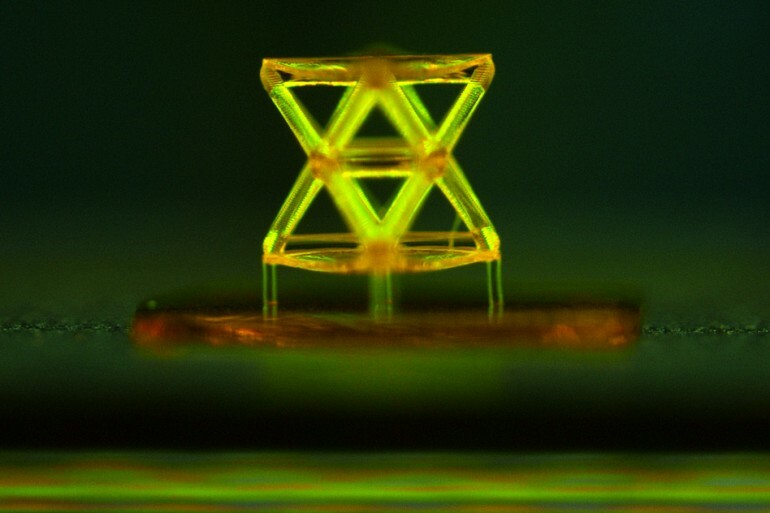 Projection micro-stereolithography operates on a very small scale that allows the formation of "microlattices," which are much like trusses and girders. Materials can even be switched during fabrication. According to the team, it can be applied to many different materials, including polymers, metals and ceramics, which is exactly what the team did using a variety of constituent materials. Firstly, the LLNL/MIT team made a polymer template coated with a metal film 200 to 500 nanometers thick, then the polymer base was melted away, leaving behind the metal in the form of thin-film tubes.The team then used the same technique but replaced the metal with ceramic to create ceramic tubes about 50 nanometers thick, which produced a material with the properties of an extremely stiff aerogel, four orders of magnitude stiffer than conventional aerogel, but with the same density. The next step was to create a ceramic-polymer hybrid, which is a polymer with ceramic nanoparticles embedded into it. This relied on a slightly different process, with the polymer removed thermally, allowing the ceramic particles to densify into a solid. When the polymer was removed, the result was a stiff, ultralight ceramic solid instead of hollow tubes. 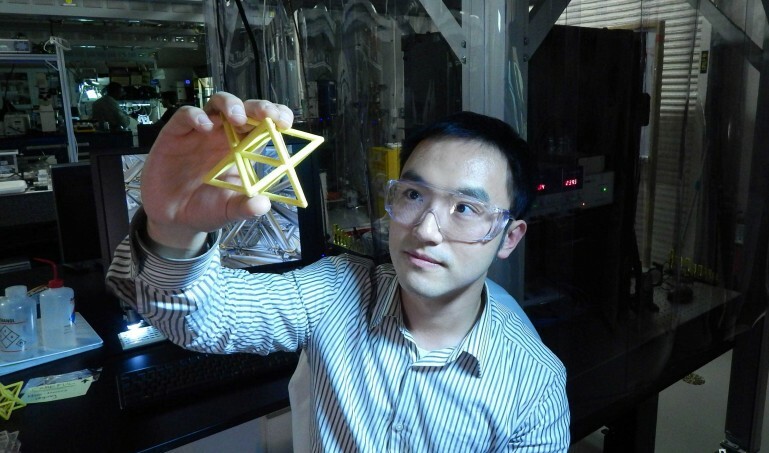 These lightweight materials can withstand a load of at least 160,000 times their own weight said LLNL Engineer Xiaoyu Rayne Zheng. The key to this ultrahigh stiffness is that all the micro-structural elements in this material are designed to be over constrained and do not bend under applied load. The team sees the materials as one day being used to develop parts and components for aircraft, motor cars, and space vehicles, and that in practical use, the material could end up being 100 times stronger than the experimental versions. The research team’s results were published in the journal Science.